With proper dental hygiene, you can maintain a beautiful smile and healthy teeth throughout your life. When you don’t take care of your teeth, decay can set in and cause tooth loss. Gum disease, also known as periodontal disease, is a leading cause of tooth loss. According to a recent study by the Centers for Disease Control and Prevention (CDC), almost half of U.S. adults over the age of 30 – nearly 65 million people – have some form of periodontitis. Periodontal disease is caused by bacteria in the mouth. The bacteria comes from the food we eat. It combines with mucus and other organic matter in the mouth to create plaque, a biofilm that coats the teeth. Only regular brushing and flossing can remove dental plaque and prevent plaque build-up. Any plaque that is not removed from your teeth will begin accumulating the minerals found in saliva. Over time, this combination of plaque and minerals will harden into tarter (also called calculus). Tartar has a yellow-brown color. Because of its hardness, tarter can only be removed by a dentist or hygienist. Plaque and tarter cause both tooth decay and gum irritation. The gums become irritated and inflamed from the bacteria. This is also known as gingivitis, and is considered the beginning stages of periodontal disease. Regular brushing, flossing and professional cleaning can usually stop gingivitis from progressing or eliminate the problem altogether. If gingivitis isn’t treated, the gum tissue will begin to pull away from the teeth, creating pockets (spaces) that become infected. As the bacteria in the area spreads, the body’s immune system kicks in to fight the infection. Both the bacteria and the immune system’s response causes bone and tissue deterioration, which leads to loose teeth and eventual tooth loss. Symptoms of periodontal disease include red, swollen or bleeding gums, difficulty or pain when chewing, bad breath and receding gums. People who smoke, have diabetes or an autoimmune disease are at greater risk of gum disease. Periodontitis can also be caused by taking certain medications. Gum diseases treatment is focused on eliminating the infection. This usually requires deep cleaning to remove any plaque and tartar. Scaling is a form of deep cleaning the gets rid of tarter above and below the gum line. 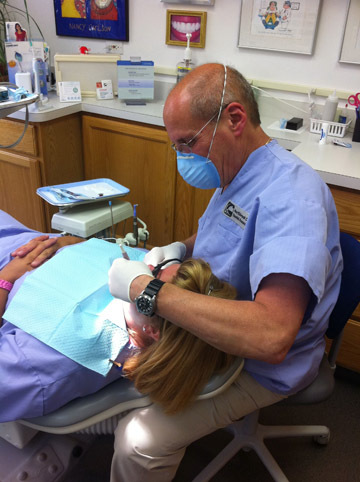 Root planing is another technique that is used to scrape off bacteria from a tooth’s root. An antibiotic may also be used to help with the healing process. After the teeth and gums have been thoroughly cleaned, keeping the area bacteria-free with brushing and flossing is critical. In severe cases, dental surgery may be needed for even deeper cleaning and to reduce the size of the pockets that have formed. Reducing pockets will make it easier to keep bacteria out of the area. Bone and tissue grafts may also be necessary if there has been significant bone and tissue loss. The best way to prevent gum disease is with good oral hygiene. This includes at-home care as well as regular dental visits. If you have red, swollen or bleeding gums, contact a Northbrook dentist and request a dental exam. Treating gum disease at any stage can help prevent the loss of your teeth.